Every year the Arvada Harvest Festival takes place in Olde Town Arvada. It begins with a parade that includes schools from all of the Jefferson County district, along with local businesses. “It was fun and fascinating to meet people that came from different area for this one event,” alum Alex Onpeng said. It’s not just the Arvada community that celebrates together. For years there have been families and friends from other cities that come together to commemorate the first concrete road that connected Arvada and Denver in 1925. Every year is different and each year this gathering always leaves people wanting more. 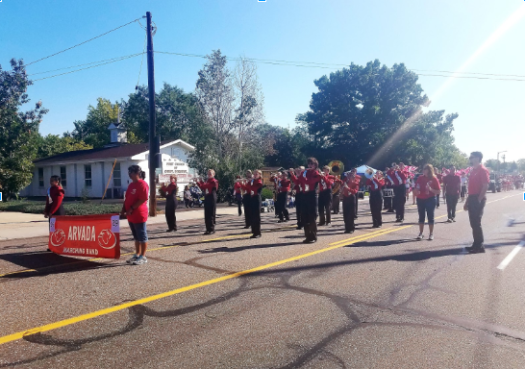 Being the 93rd year, many of the Arvada students and staff came to support and participate in the parade and later that day, the festival itself. “Arvada showed up pretty strong for the high school,” Abling said. The Cheers, Poms, and Marching Band practiced and performed special routines for the crowd, while the football players handed out candy with the staff and students. Everyone showed school pride while wearing their respective Arvada gear. “Everyone was super hyped up. [There was] a lot of school spirit,” senior Laila Madrid said. So much of the excitement showed throughout the festival. The energy was constant from the early morning to the late evening as Arvada honored its history. “If it wasn’t required to go for school or poms, I still would’ve done it, I still would have gone and been in it,” sophomore Sophia Nicoles said.